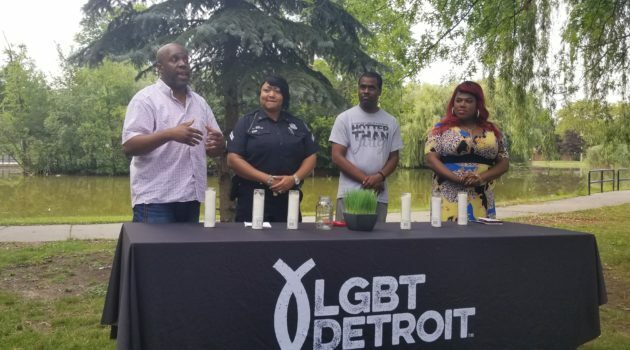 HTJ Community Chat Group - LGBT Detroit Executive Director Curtis Lipscomb speaks to the crowd at the candlelight vigil while Dani Woods, Lawrence Pennymon and Cierra Burks Malone look on. Detroit Police Chief James Craig made sure to emphasize his support for everyone in the crowd of about 100 people who came out for the 4th annual community chat in Palmer Park. That is the event that begins the LGBT Detroit-sponsored Hotter Than July festival. Hotter Than July the “world’s second oldest ‘Black Pride’ celebration,” said event organizers, and has morphed not only into a celebration of the local black LGBTQ community but an almost week-long social justice awareness event. Craig ended his 10-minute address talk with an expression of gratitude to the Detroit LGBTQ community. It was then that Deputy Police Chief and Commanding Officer of the Chief’s Liaison Community Unit Todd Bettison began his address to the crowd. The chat is organized each year by Detroit Police Department LGBT Liaison Corp. Dani Woods. Woods gave out several awards for “dedication and outstanding service to the LGBT community and their work in the City of Detroit.” Awardees included Satrice Tillman, Nabill Adbulla of Wrigley’s Pharmacy, Dwayne Cole Jr. of the Ruth Ellis Center, T.J. Rogers from Freedom House, Between The Lines’ own Kate Opalewski and Lawrence Pennymon and Jamesion King of LGBT Detroit. Woods also gave awards to several local community agencies including Fair Michigan, Freedom House, the LGBT Chamber of Commerce, LGBT Detroit, Equality Michigan, Affirmations and Wayne Country SAFE. Following the chat, the crowd proceeded to walk across the park to where the vigil is traditionally held. There, in front of the blue spruce memorial tree, a crowd of about 60 watched as a drum circle played, candles were lit and the Rev. Jeffrey Seals of One Church Detroit poured libations and called forth the spirits of the elders.